Pork chops were on my menu this evening and what goes better with pork but scalloped potatoes. When I was younger my mom used to make this meal. She would slice the potatoes, mix with cream of mushroom soup, set the pork chops on top of that and bake for an hour. There were times she would use the crockpot too. I used to love that meal. 🙂 Here is a slightly different version of “scalloped potatoes”. In a saucepan, heat up the cream with sprig of thyme and chopped garlic. While cream is heating up, butter a casserole dish. (I used a glass 13×9 inch baking dish). Place a layer of potatoes in an overlapping pattern and season with salt and pepper. Pour some of warmed cream over potatoes and top with parmesan. Repeat 2 times. Bake, uncovered for 45-60 minutes. Voila! All done! I seasoned the pork chops with kosher salt and pepper on both sides. Seared sides in a frying pan to a nice brown color. Placed in a baking dish and placed along side the potatoes. The pork chops baked for 25 minutes at 400 degrees. Simple and delicious meal! I found this recipe on a fellow bloggers site and also on Food Network. These were hard to resist and I just had to bake them! I only made a couple of changes which I have noted in the ingredients. Hope you give these a try. They are, of course, simple and delicious! Brownie layer; In a saucepan on medium heat melt the butter. Remove the butter to a large bowl and add the sugar, vanilla, cocoa powder, salt, food coloring, and vinegar, in that order, mixing between additions. Whisk the eggs in a small bowl and stir it into the cocoa mix. Fold in the flour until lightly combined. If you use walnuts, stir those into batter. Take out 1/4 cup batter and put rest in prepared baking dish. Cream Cheese Layer: Blend together the cream cheese, sugar, egg, and vanilla in a medium bowl. Gently spread the cream cheese layer on top of the brownie batter in the pan. Dollop the remaining brownie batter over the cream cheese layer. Using the tip of a knife drag the tip through the cream cheese mixture to create a swirl pattern. Bake the brownies for 30 minutes. (That was long enough, really!) Remove to a cooling rack and allow them to cool complete before cutting. They taste great warm but are even better the next day. Enjoy! Kent and I find these burgers very tasty. I enjoy being able to come home, make a meal and get it on the table in an hour or less. Give it a try! 1. In medium bowl combine ground beef with all ingredients. Mix together lightly but thoroughly. 2. Shape into 4 patties. 3. Grill or fry in skillet until done to your liking. 4. When done place on toasted (or not) roll and top with salsa, sprinkle with cheese and chow down! I am sorry I didn’t take any photos for this recipe. When I make it again I will post some photos. As always I used my food processor for this recipe. This pizza crust has a nice flavor and bakes really well. 1. Proof yeast in lukewarm water. (I add a 1/2 teaspoon of sugar to the yeast and water). Proofing is when there are foamy bubbles on top. This takes about 5-8 minutes. 2. While yeast is proofing add all dry ingredients to food processor. Mix the olive oil, honey and salt together then add to food processor. 3. Add yeast mix to food processor. Mix for about 45-60 seconds. The dough forms a ball above the blade. Remove dough to a large oiled bowl. (I used olive oil.) Cover with plastic wrap and put in warm place. (The microwave is a great place for pizza dough to rise) Let rise about 45 minutes. 4. Punch dough down. I form it into a large ball and cut in half. I then form each piece of dough into a ball and place in a Pam sprayed gallon plastic ziploc bag. Place the dough balls in the refrigerator for at least 2 hours or overnight. (I did it overnight) When you are ready to use bring the dough to room temperature. 5. On a floured surface stretch each ball into a 10-12 inch circle. Top with your choice of toppings. Place in a 450 degree preheated oven for 10-12 minutes and there is your simple and delicious pizza! We had another enjoyable Pizza Friday. For our state pizza we chose Montana. This pizza is from When In Rome Mediterranean Restaurant, Big Fork, Montana. The name of the pizza is “Best Pizza Ever”. We started the evening with a cheese pizza on whole wheat pizza crust, then the Purple Pig Pizza (remember Indiana). The Cheese pizza on whole wheat pizza crust was quite delicious. We all agreed this was the best crust yet. The Purple Pig pizza is with pulled pork. Martin really likes this one. Eric, now that he is eating meat, is also a fan. YUMMY! We finished the night with Montana, “Best Pizza Ever”. This pizza was on a whole wheat pizza crust with pizza sauce, gorgonzola cheese, roasted red peppers, red onion, garlic and pepperoni topped with Mozzarella. The Gorgonzola cheese is an Italian Blue Cheese and had quite the bite. I thought all the flavors went really well together. However, the cheese was a bit too much for me. Kent, Martin and Sean really enjoyed this pizza. The crust was a definite plus and I will be making Whole Wheat Pizza Crust on a regular basis. Martin and Sean really liked the flavor of the cheese. They both like strong flavored cheeses and that works for them. Kent thought all the flavors worked really well together. He thought the cheese had a bite but he liked it. Kyle did not like it. Jordan ate half and threw out the rest! I think you know what he thought about it. 😦 Rachel was okay with it but would not want it again. Eric opted out of this one. I would make this one again. It was easy to make and even though the cheese had a bite it went really well with it. Another wonderful Friday. Family, friends, food and fun! Can’t ask for more than that can you? I know, February is Valentines Day and Chocolate Lover’s month. I should make a chocolate bundt cake, right? Wrong! Bananas were getting kind of ripe so I thought a bundt cake would be a great way to use them. Hope you like it! 1. Preheat oven 350 degrees. You will need a 12 cup bundt pan. I use Pam Cooking Spray and also flour the bundt pan. This makes it much easier to remove cake out of mold. 2. I used my stand up mixer with the paddle attachment. You can use a hand mixer also. Beat the butter until creamy. Add the sugar and beat at medium speed until pale and fluffy. Beat in the vanilla, then add eggs one at a time, beating for about 1 minute . Reduce mixer to low speed and add bananas. Finally, mix in half the dry ingredients, all the sour cream and the rest of the flour mixture. 3. Scrape batter into prepared bundt pan. Bake for 60-70 minutes or until a thin knife inserted deep into the center of the cake comes out clean. Remove from oven and place on cooling rack. Cool for 10 minutes and then remove from bundt pan. Don’t let it cool longer than 10 minutes or it will be more difficult to come out of mold. 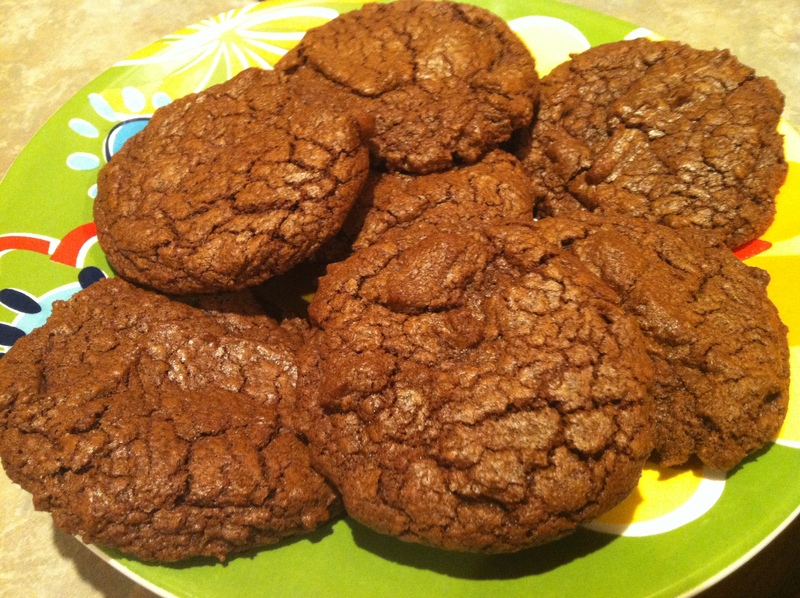 The recipe was from Dorie Greenspan’s cookbook, “Baking: From My Home to Yours”. The cinnamon was not included in her recipe. You don’t have to add it. We happen to enjoy cinnamon in our Banana Bread so why not in our Banana Bundt Cake. Eric couldn’t resist and had to have a piece once it came out of the oven! After the cake cooled I topped with powdered sugar. If you want to make a glaze you could do that too. Enjoy! I make wings by mixing 1/2 cup Buffalo Chicken Wing Sauce & 3 Tablespoons Sriacha Sauce. Melt 1/4 cup butter. Preheat oven to 425 degrees. Rinse wings with cold water and pat dry with paper towel. Place in a foil lined baking pan. Brush wings with melted butter then sprinkle with salt, garlic powder and cayenne pepper. Place in oven and bake 15 minutes, turn over wings and baste other side with butter. Bake 15 minutes then baste with wing sauce, bake 15 minutes and turn over wings baste other side with wing sauce and bake 15 minutes. Remove from oven and they are ready to eat! We made the chicken wing pizza by starting with pizza sauce, topped with chopped chicken wings and mozzarella. Eric, Kent and Sean enjoyed this pizza. They all agreed the spiciness from the wings was lost on the pizza. I guess next time we will have to work on that. The Salmon pizza went over well with Martin, Rachel and Sean. That was a success when I made it previously and it was the same this time too. Martin wanted me to add feta cheese this time. I added on half the pizza since Rachel is not a fan of feta. Both Martin and Sean took the rest of this one home. The rest of the pizzas were eaten and no leftovers for the weekend. I was chatting with my brother the other day. He was saying he is sick of pizzas just reading my blog! (He may defend that comment but that is what he said.) I asked the crew last night if they were tired of having pizzas. Their reply, “NO WAY, KEEP GOING”! So with that being said, see you next week! Versatile Blogger Award – Me? Thanks! Visit a blog about great food and awesome photos! 2. I have worked in insurance since I was 21. No, I will not divulge how “young” I am! 3. Being positive in my life is how I get through the day, week, year. Negativity gets you nowhere. 4. Food is a passion that only needs to fill my kitchen & home and no where else. I do love to share though. 5. I love makeup which include MAC cosmetics and frequent trips to Sephora and Ulta. Lipgloss is my weakness. 6. I need to get out of my comfort zone A LOT more. 7. I love music, specifically blues, jazz, techno, trip hop, lounge AND Amy Winehouse is my favorite artist. By the way, I loved her before she passed away. I will let the above bloggers know I thought of them. Thanks again, Sugar Spice and Bacon! Oh, and thanks to whoever comes to check out my blog! These cookies are a hit in our house. They definitely wake me up when I have one! Can you have just one? They are delicious but I am not sure how simple. They have a few steps but are worth every single one! 1. Sift together flour, cocoa, baking powder, and salt in medium bowl; set aside. Melt chocolate in medium heatproof bowl set over pan of almost-simmering water, stirring once or twice, until smooth; remove from heat. Beat eggs and vanilla lightly with fork, sprinkle coffee powder over to dissolve, and set aside. NOTE: I use 2 bags of chocolate chips. I use a semi sweet chocolate bag plus 1/2 cup of the milk chocolate chips and melt those. I use the rest of the milk chocolate chips in the batter. 2. In bowl of standing mixer fitted with paddle attachment (or with hand mixer), beat butter at medium speed until smooth and creamy, about 5 seconds (15 seconds with hand mixer). Beat in sugars until combined, about 45 seconds (1 1/2 minutes with hand mixer); mixture will look granular. Reduce speed to low and gradually beat in egg mixture until incorporated, about 45 seconds (1 1/2 minutes with hand mixer). Add chocolate in steady stream and beat until combined, about 40 seconds (1 minute with hand mixer). Scrape bottom and sides of bowl with rubber spatula. With mixer at low speed, add flour mixture and mix until combined, about 40 seconds (1 minute with hand mixer). Do not overbeat. Cover with plastic wrap and let stand at room temperature until consistency is scoopable and fudgelike, about 30 minutes. 3. Meanwhile, adjust oven racks to upper- and lower-middle positions and heat oven to 350 degrees. Line 2 cookie sheets with parchment paper. (Definitely use the parchment paper for these cookies) Leaving about 1 1/2-inches between each ball, scoop dough onto parchment-lined cookie sheets with 1 3/4-inch diameter ice cream scoop. 4. Bake cookies until edges have just begun to set but centers are still very soft, about 10 minutes, turning cookie sheets from front to back and switching from top to bottom racks halfway through baking. 5. Cool cookies on sheets about 10 minutes, slide parchment with cookies onto wire rack and cool to room temperature; remove with wide metal spatula.